Take advantage of our special offer and reserve your Stay to the gates of Naples at incredible prizes! 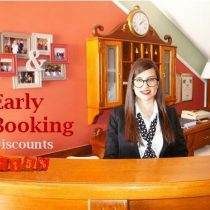 Booking your room not later than 60 days prior the arrival date, you will enjoy a further 15% discount on our best rates. Take advantage of it now…. Limited availability! 1) Offer is valid reserving via our official web-site only. 2) At the moment of confirmation, total amount of your stay will be charged immediately. 3) Reservation is non refundable in case of cancellation.